On the night Samuel Langhorne Clemens was born Halley's* comet was visible in the sky. Even though he was born prematurely and was small and weak, his mother thought the comet was a good sign. He survived even though many premature babies in those days did not. He was born to Marshall Clemens and his wife Jane in 1835. He had four older brothers and sisters. The family had moved from Tennessee to Florida, Missouri where Sam's father became a partner in his brother-in-law's general store. He also opened a law office. Marshall was not a good businessman. His ventures failed and he moved the family to Hannibal, Missouri where he bought some land. Sam had an exciting childhood. Hannibal was on the banks of the Mississippi River and he and his friends fished, hunted for treasure, and watched the steamboats go up and down the river. When he was six years old he spent the summer with his aunt and uncle. There were eight cousins. The family was well-to-do. Young Sam flourished* in the environment. He visited with the slave families and listened to their songs and stories. Sam was continually getting into trouble. He sneaked out at night. One of the older boys in the group was Tom Blankenship. Later in his life Sam wrote a story whose main character was based on his friend Tom. He called the boy in the story Huckleberry Finn. When he was nine years old Sam hid on a steamboat and travelled down the Mississippi River. They put him off at the next stop and relatives helped him return home. After that adventure he determined to become a steamboat pilot when he grew up. In the town he viewed the ill-treatment of slaves and he knew slavery was wrong. Not all slaves were mistreated, however. His Uncle John Quarles, with whom he had spent a summer, treated his slaves well and cared for them. The Mississippi River posed a danger to children. Two of Sam's friends drowned in the river, and Sam himself was saved from drowning on two occasions by slaves. When Sam was 11 his father died. Money was scarce. The next year he was sent to be a live-in apprentice* at the newspaper Missouri Courier. He was a type-setter, setting the metal letters by hand. He worked there for two years, then he went to work for his brother who had bought a newspaper business. Sam soon tired of not being paid for his work and went to St. Louis to work as a printer. Next he went to New York, then Philadelphia and Washington D.C. Finally he moved to Iowa to work for his brother again, this time with pay. At a printer's banquet in Keokuk, Iowa he gave his first after-dinner speech. The crowd loved it. He worked for newspapers for 10 years and decided to go to Brazil, but he never got to Brazil. He had a chance to learn how to be a riverboat pilot. He had to learn how to navigate a steamboat down 1300 miles of the Mississippi River. It was important for the pilot to keep the boat in deep water. They measured the depth of the water by dropping a cloth line into the water. The line had a piece of lead attached to the end to make it sink. The colored cloth line marked the fathoms. A fathom* was 6 feet. If the sailor yelled "Mark, twain" (2 fathoms), they knew they needed to head for deeper water. 12 feet was the boundary between deep water and water too shallow for the boat. After two years he had his pilot's license. He had fulfilled his childhood dream. The job paid well, $3,000 a year (about the same as $61,000 in modern times). In comparison some workers in other occupations at that time earned about $500 a year. Sam was rich. He could send money to his mother as well as spend some on himself. When the Civil War started, steamboat traffic on the Mississippi was halted in order to stop the flow of supplies to the South. Sam's piloting days were over. Missouri was a slave-holding state, yet it was still a part of the Union. His family persuaded him to side with the South, the Confederacy. For a short time he became a Confederate soldier, "Lieutenant" Samuel Clemens was a part of a group called the Marion Rangers. Local farmers had outfitted the group of 15, boys who had grown up together. Each man got a mule, a rifle and a few supplies. When they heard the Union soldiers were coming they retreated. * The last thing Sam wanted to be was a dead hero. He would later write I knew more about retreating than the man that invented retreating. After two weeks the group disbanded and Sam went back to Iowa and hid at his brother's house. He would later write about it in a short story "The Private History of a Campaign That Failed". Later he and his brother Orion started to Nevada by stagecoach. They had jobs waiting for them. The stagecoach driver got fresh horses every 10 miles. 1000 miles and 20 days later they arrived in Carson City. Sam started panning for gold and investing in mines in Nevada. He went broke. At night he wrote articles for newspapers and earned a few dollars. The editor of the paper in Virginia City offered him a job at $25 a week and he took it. He had to walk 130 miles to get the job because he had no money. 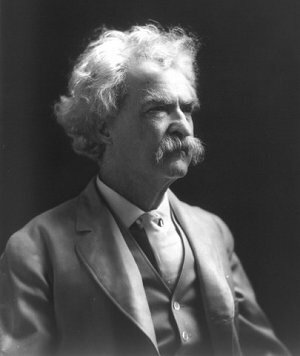 Six months later while writing for the Territorial Enterprise he signed an article "Mark Twain". Samuel Clemens continued to use the pseudonym,* or fictitious* name when he wrote. 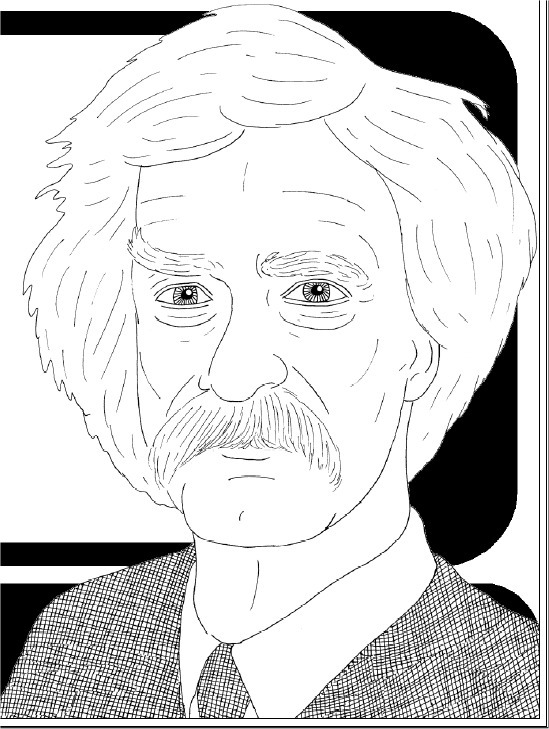 The name "Mark Twain" was a nautical term* referring to the depth of the water. The name "Mark Twain" had also been adopted by another man and Clemens, upon that man's death, took the name. He wrote about it in the following letter. Mark Twain was the nom de plume* of one Captain Isaiah Sellers, who used to write river news over it for the New Orleans Picayune. He died in 1869 and as he could no longer need that signature, I laid violent hands upon it without asking permission of the proprietor's remains. That is the history of the nom de plume I bear. 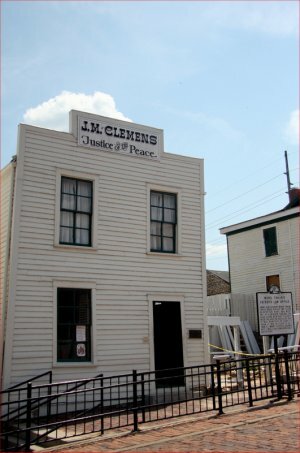 While working in Virginia City he visited San Francisco. He liked the big city and moved there. He worked at a newspaper and befriended Steve Gillis. He and Steve got in trouble for playing pranks and had to leave town. They went to look for gold. He didn't find gold, but he got some good ideas for stories to write. One man told about a jumping frog from which Twain wrote The Celebrated Jumping Frog of Calaveras County. It was also published as Jim Smiley and the Jumping Frog, The Notorious Jumping Frog of Calaveras County, and The Jumping Frog. He soon had an opportunity to write a series of stories from Hawaii for the Sacramento Union. The islands were called the Sandwich Islands at that time. He stayed there four months and wrote 25 articles. When he returned to San Francisco he gave a talk about his trip to Hawaii. He used his drawling "long talk" in giving the presentation. People were fascinated by him. It was so successful he gave the talk again and again in other cities. His next job in Europe and the Middle East lasted five months. On the cruise to Europe he met Charley Langdon who had a beautiful sister named Olivia. Sam fell in love with her the first evening he spent with her and her family. He had his book The Innocents Abroad published and he continued the lecture tour. Finally he had enough money to marry Livy. They married in 1870. As a wedding present her father gave them a grand house and paid for a cook, a maid, and a horse and carriage. When Livy's father died she had a nervous breakdown. The strong medicine they gave her affected her baby, Langdon. They left Buffalo and moved to Hartford Connecticut. Their next child Susy was a healthy baby girl, but three months after her birth their first child Langdon died. Twain traveled to England to get ideas for a new book. He was famous there. Livy drew up plans for a house and they went to Europe for six months while it was being built. When they returned, the beautiful house was nearly finished and Livy had another little girl, Clara. Mark Twain started his next book which would become his masterpiece, The Adventures of Tom Sawyer. He used himself as a young boy to portray Tom Sawyer. They moved into their new nineteen-room home. Their home was always open to friends and guests. He began to write the story of Huckleberry Finn based on the life of his friend Tom Blankenship. "Jim" in the story was based on Uncle Dan'l, the slave who had such an influence on the young Sam Clemens. 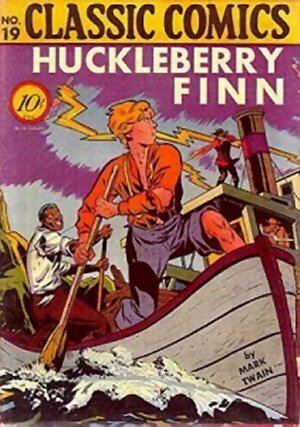 It took him seven years to write The Adventures of Huckleberry Finn. It was published by his own publishing company. Twain wrote a historical novel called The Prince and the Pauper. His next book was A Connecticut Yankee in King Arthur's Court, a science fiction* novel. Baby Jane joined the family and Katy Leary lived with the family as nanny and personal maid. The family began to have financial problems and couldn't afford all the entertaining. They closed the house and moved to Europe and lived in rented houses. He went back to the United States to go on a speaking tour. He earned enough money to pay most of their debts. Susy, their daughter, died of spinal meningitis at the age of 24. The family returned to America in 1900. Mark Twain was famous. His books were selling well. They moved to New York. His wife Livy became ill. The doctors suggested the climate in Italy might help her, so they moved to Italy, but in 1904 she died in Florence. 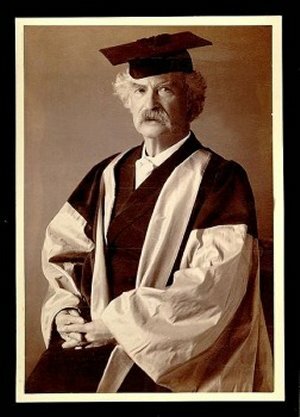 When Mark Twain was 70 years old he was honored in New York at a banquet. His publishers had invited 200 people. Two years later Oxford University in England awarded him an honorary college degree. He was very proud of it. When he went back to New York he began to wear a white suit every day. Jean his daughter died. Now Jean along with Livy, Susy, and his only son Langdon, were all gone. Only he and Clara remained. Clara was now married to a concert pianist. On April 21, 1910 Samuel Clemens died. Halley's comet was just passing by. The previous year he had written in his autobiography "I came in with Halley's Comet in 1835. It's coming again next year (1910), and I expect to go out with it. The Almighty has said no doubt, 'Now here are these two unaccountable freaks; they came in together, they must go out together'". This page displayed 57,765 times.